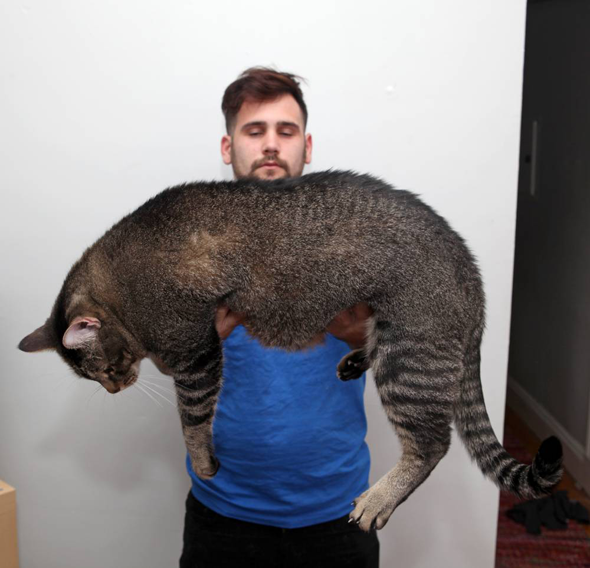 A giant three-foot long cat that was nicknamed Catasaurus Rex has finally found a home. Pickles' size, and insatiable appetite, had put off a few potential owners, which meant he was unable to find a new home. After wandering the streets for a while, the 21 pound feline was taken in by the Massachusetts Society for the Prevention of Cruelty to Animals, which also made his story public. He was spotted on the animal welfare charity's website by a couple from Boston, United States, who decided to adopt him. 'When we first saw Pickles he looked like such a beast - but he looked really cool. He's actually bigger than some dogs,' said one of the new owners Andrew Milicia. Mr Milicia and his girlfriend Emily Zarvos had been picked from a pool of around 50 animal lovers that had offered to take the cat.